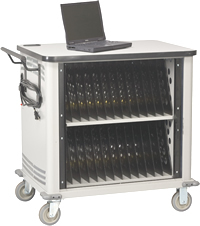 Laptop Carts, Laptop Storage Carts, Mobile Laptop Cart. Store and charge your laptops with the added benefit of security and mobility! 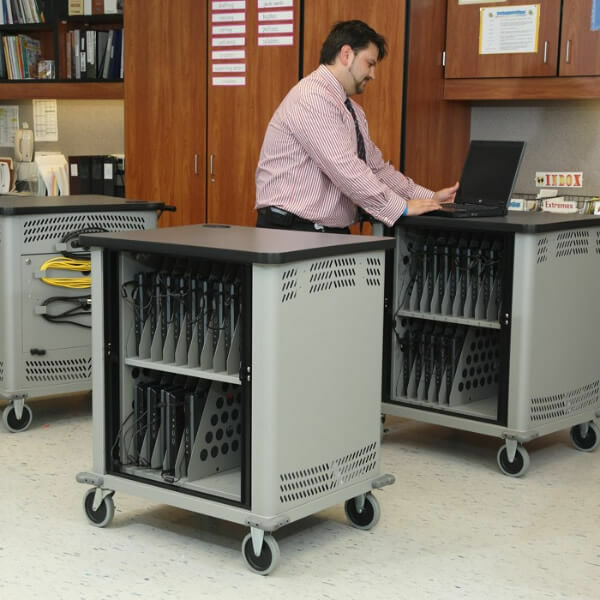 Designed with input from tech coordinators and educators, these Mobile LapTop Carts provide a secure environment to store and charge laptops and other peripherals while still remaining mobile. The laptop slot dividers in these computer carts are removable to facilitate the storage of other devices when laptop slots are not being used, making this	a complete storage solution! 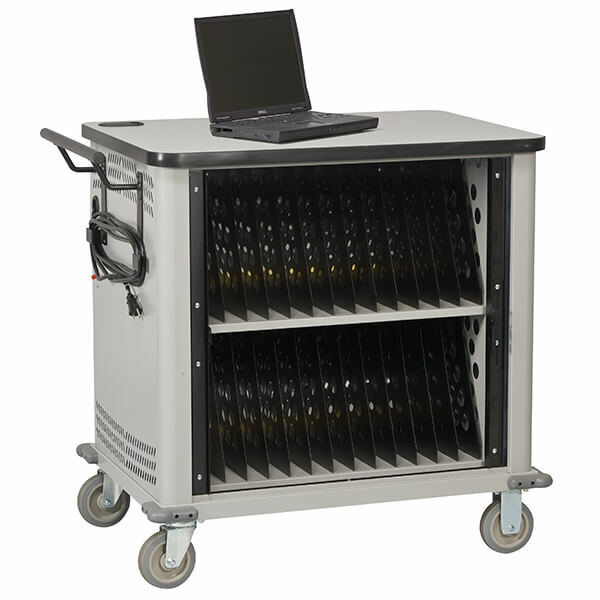 The dual entry capability of the LapTop Cart helps to ensure the security of stored equipment and timer configurations. The tambour door opening allows teachers and students to access the laptops and other equipment while limiting access to the electrical components and timer, which can be accessed through the locking rear door panel by IT staff. These accessories can also be chosen above as options when you order the LapTop Cart. If you decide after purchase that you would like to have one of these options, you can purchase it separately below. 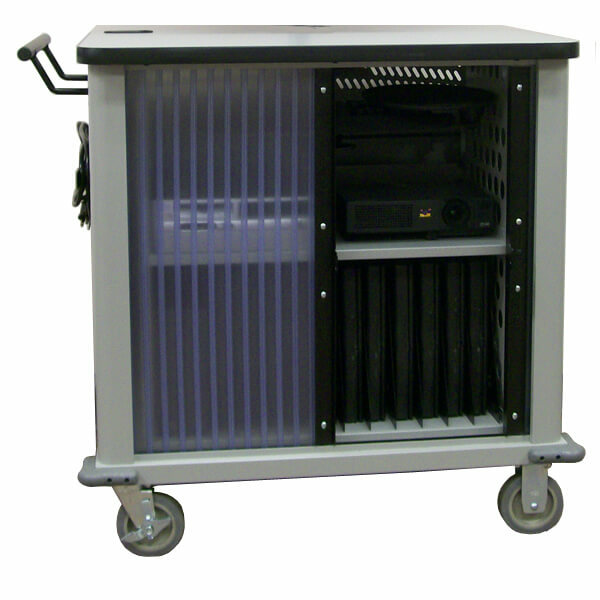 This optional Pop Up Power Center provides power and cable access to the top of the cart, allowing users to power equipment being used on top, such as projectors. This power center needs to be plugged into an external plug. 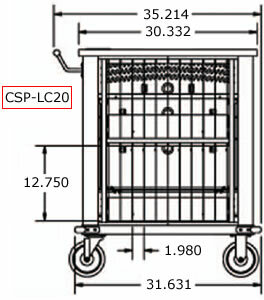 A second handle can be added to the cart to allow cart to be transported from either side. Ships fully assembled (excluding handle and optional pop up power center) via freight with tailgate service for a flat rate freight charge of $189. Usually ships in 7 - 10 business days. If padlock option is chosen, the padlock is a keyed different version and ships separately. Estimated product weight: 154 lbs. Estimated Shipping weight: 184 lbs. Estimated product weight: 176 lbs. Estimated Shipping weight: 206 lbs. Estimated product weight: 208 lbs. Estimated Shipping weight: 238 lbs.